The pocket is sewn into the underarm of the shirt. 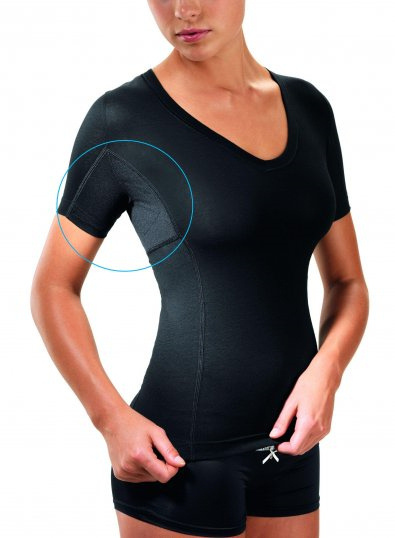 Should the absorbent inserts become too wet, there is a waterproof membrane sewn into the underarm of the shirt so you can be sure there will be no sweat or stains on your clothing. The fluid blocker is covered with another layer of absorbent fabric. 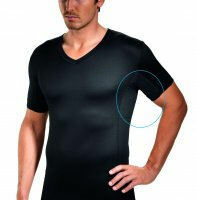 These first layers are usually sufficient to absorb your sweat. You can use any kind or brand and they are less expensive than a special absorbent. Tempo Pocket tissues are ideal as they are strong enough to hold together when wet. Customer suggestion: use menthol-scented handkerchiefs. It also gives a pleasant fragrance. • produced in an environmentally conscious establishment.